What is the WS4777 Wall Switch? The WS4777 is a prepacked 3-way operable switch. The package comes with both a master switch and a secondary switch that fit within your homes existing toggle style switch plate covers. This switch is simple to install and will upgrade your switches to enable you to control them remotely or on a timer via X10's controllers. This can be used in single operations as well. If you would like to have the option of adding a secondary switch at a later time, simple cap off the traveler wire and install in a single pole configuration. When you are ready, you can then run the traveler wire to your secondary switches location. These switches are simple, affordable and breeze to set up. Do you need additional secondary switches? Perhaps you need a 4-way configuration? 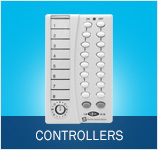 You can use the CS277 Secondary Switch for additional 4-way or more configurations. What are the advantages of using the WS4777 3-Way Wall Switch? 3-way design and fuinctionality at a fraction of the cost of other 3-way options. What other products work with the WS477 Wall Switch?